The action comedy Stop! 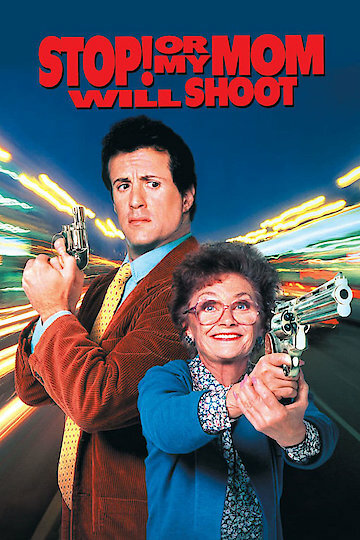 Or My Mom Will Shoot stars Sylvester Stallone as tough-guy detective Sgt. Joe Bomowski, and Estelle Getty as his mother, Mrs. Tutti Bomowski. Mrs Bomowski comes for a visit after her son's girlfriend leaves him, and she decides to stay for a while. During her time staying with her son, Mrs. Bomowski begins to meddle in his work. She becomes more and more involved with his cases, which he finds troublesome and embarrassing. He, and everyone else, sees her as a frail old woman with a meddlesome streak. Meddling in his affairs, complaining about his filthy apartment, and trying to get involved in Sgt. Joe's love life makes life difficult for the detective. Eventually, however, Mrs. Bomowski proves she is far more than a frail old woman when a criminal threatens her son's life, prompting the title line. Stop! Or My Mom Will Shoot is currently available to watch and stream, download, buy on demand at Amazon Prime, Starz, Amazon, Vudu, Google Play, FandangoNow, iTunes, YouTube VOD online.